Well, thanks to snooping around her blog and to the great gods of Google, I discovered that the Liebster Award is a way of promoting blogs that have less than 200 followers. Once nominated, you are to nominate five other blogs that you feel are worthy of getting a larger audience. Hmm… There’s only one problem: I think I follow blogs that have too many followers to be eligible for this award. However, I’ve decided not to let that stop me. This Danielle chick is pretty cool. She has recently decided to become a writer, and her blog is about her journey as she writes her first novel. It’s nice getting to read about a fellow writer’s process. You should definitely check her out. I met Stephen – oh, it’s been a few years now – but I met Stephen in Kazakhstan. He went to a university in Texas that for some reason seems determined to stay in my life one way or another. He and his wife Kayla are currently teaching in China, and their blog is devoted to their adventures. It’s full of exceptional writing, pictures, and videos. If you want to know what it’s like to teach in an international high school, this is a good start. High class literary thoughts by a group of classy bloggers. I love it. This blog is one of my favorites because it’s so nerdtastic. (Is that a word? Because it should be. And David, I mean that as a compliment.) David reviews books, TV shows, films – whatever tickles his fancy. He’s big on the genres of fantasy and sci-fi, which I enjoy, too. Be prepared for references to Middle Earth and Gallifrey. Okay, so this is a tumblr blog, and I’m pretty sure the author’s got way too many followers, but I have checked this site (almost) every day since I discovered it a couple months ago, so I think it warrants two thumbs up. Renee is a fan of Suzanne Collins’ The Hunger Games, and with the recent release of the film adaptation, she has created a very special blog. 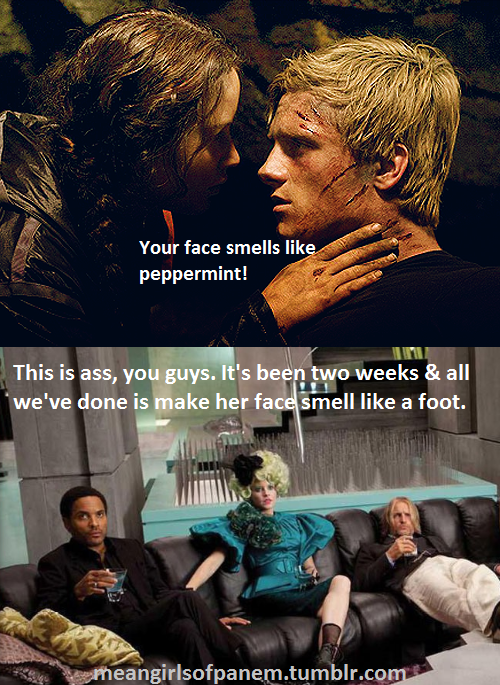 This is what happens when you take the citizens of Panem and bring out their inner Regina George. 1. Thank your Liebster Blog Award nominator on your blog. 3. Copy and paste the blog award onto your blog. 5. Inform them of the award by leaving them a comment on their blog. This entry was posted in Geek Moment. Bookmark the permalink.